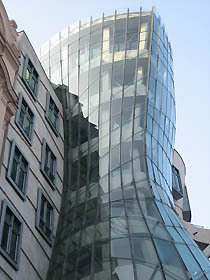 The site of Gehry's Dancing House was originally occupied by a house in the Neo-renaissance style from the end of the 19th century. That house was destroyed during bombing in 1945, its remains finally removed in 1960. The neighboring house (with a small globe on the roof) was co-owned by Czech ex-president Vaclav Havel, who lived there from his childhood until the mid-1990s. He ordered the first architectural study from Vlado Milunic (who has been involved in re-building Havel's appartment in the neighboring house). 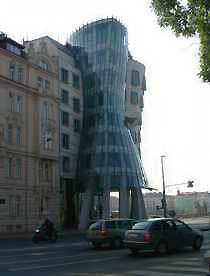 Afterwards the Dutch bank ING agreed to build a house there, and asked Milunic to invite a world-renowned architect. 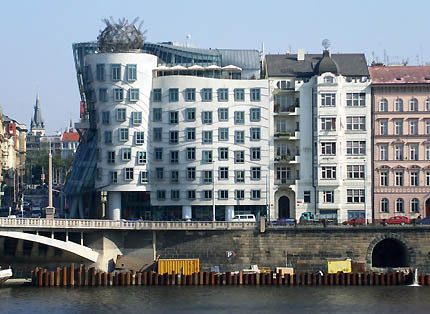 Milunic first asked Jean Nouvel, who rejected the invitation because of the small size of the site (491 square meters); he then asked Frank Gehry, who and he accepted the challenge. 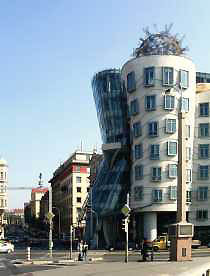 Gehry had an almost unlimited budget, because ING wanted to create an icon in Prague. The construction started in 1994 and the house was finished in 1996. 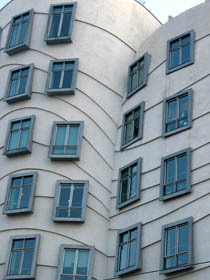 Its unusual shape and technical solutions caused a big public debate. After ten years emotions are over, and the house has its place in modern Prague. 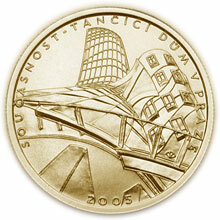 In 2005 the Czech National Bank issued a gold coin with the motif of the Dancing House, as the final coin of the series "10 Centuries of Architecture." The house is located on the corner of the embankment Rasinovo nabrezi and the street Resslova, within walking distance from the underground station Karlovo namesti. The house is used as an office building and it is not open to public. However, you can visit the restaurant La Perle de Prague, located on 7th floor, with a nice view of the river and Prague Castle panorama. Visit the restaurant's web site at www.laperle.cz or call +420 221 984 160.